Going to a coffee shop is truly a hassle, not to mention the hard hit that your wallet takes every time. Spending money on coffee sure does add up quick. Let us suppose you spend around three dollars a day on coffee, for 30 days. That’s over $90 a month! I myself cringe when thinking about all those months I’ve spent money on morning coffee at Starbucks. So what we've got here is a grinder and an espresso machine in one unit. It turns out there's a lot to like here. Good design should be pleasing to look at but beyond aesthetics, it needs to work well and easy to use. Usually, when you buy a semi-automatic espresso machine, you either already have or will be buying a grinder. With this machine, the grinder is built right in and it's a pretty good one. I like the hopper on this one, it's not large, but the hopper really isn't the place to store beans. Along with the 16 grind settings, you have adjustable automatic dosing for single and double shots as well as manual dose to select single or double. The grinder starts and stops automatically. The amount dose can be finely adjusted using the grind amount knob. For manual dosing, just press the Portafilter in and hold. This will continue to grind until you release. The pressure gauge on the Barista Express Espresso Machine is indeed functional! How cool is that? In essence, the pressure gauge, located at the center of the control panel, shows to the user whether the internal pump is pushing hot water through the coffee grounds within the optimal pressure range. Most people do not understand the importance of the pressure of which the internal pump is pushing the hot water through the coffee grounds. To break it down, not enough force by the pump will cause the water to flow through the coffee grounds too quickly. In other words, too little force results in an under extracted and sour-tasting espresso. On the other hand, to much force will cause the resultant espresso to taste a bit bitter. Unlike on other cheaper espresso machines, having a pressure gauge is important as it shows the consistency of the espresso machine. As mentioned earlier, on the center of the display panel is an eye-catching pressure gauge. To the right of the pressure gauge are three buttons one of which is labeled as “Program.” The other two buttons are for choosing whether to brew a single or a double espresso shot. Moreover, to the left of the pressure gauge are large circular buttons labeled “Power” and “Filter Size.” In addition to the “Filter Size” button, to the left is a knob for setting the precise amount of coffee grounds the grinder will produce automatically for your choice of single or double sized espresso filters. Fill the bean hopper and the water tank. Drop your desired shot filter into the portafilter basket. Push the portafilter basket backward into the grinding cradle. Tamp down the grounded coffee with the included tamper. Choose the desired espresso shot size on the display panel. A small push and release of the portafilter basket slightly hit a button on the back of the cradle which sends a message to the grinder to automatically fill the filter basket to the selected espresso shot size. You can also manually grind the coffee beans by gently pushing it back and holding it in place. To prime the perfect espresso shot with the Breville Barista Express, you need to hone your technique. With just a little bit of practice, you’ll become a pro in no time. Don’t get me wrong, the Breville BES870XL Barista Express Espresso Machine is top notch. However, to experience the best tasting espresso, you need to properly tune your focus on how you prepare your espresso. For example, I tried setting the grinder to a level 4 coarseness and my resulting shot was mediocre. It wasn’t the best. However, after changing the grinder to level 2 coarseness, the shot ended up being incredible in taste. The rich taste lingered longer in my mouth than many of the other shots I made with foreign espresso machines. After I honed that technique, I had no trouble in reproducing the great tasting shot consistently. Altering brewing variables, such as adding larger amounts of grounds or tamping the filter down a bit too hard, will defiantly impact how your shot turns out to be. Everyone has their own preference for the perfect tasting espresso. Steaming milk with the Breville BES870XL Barista Express Espresso Machine was quite fun. I haven’t faced any issues while steaming my milk with the Barista Express. After the steam boiler reached the optimal temperature, it produced the desired result with ease. The Breville BES870XL Barista Express Espresso Machine is one of the easiest espresso machines to clean in my opinion. The reason for that is because the Breville BES870XL Barista Express does not have that many moving parts or messy reservoirs to maintain. Moreover, the drip tray can easily be removed in order to wash with hot water. 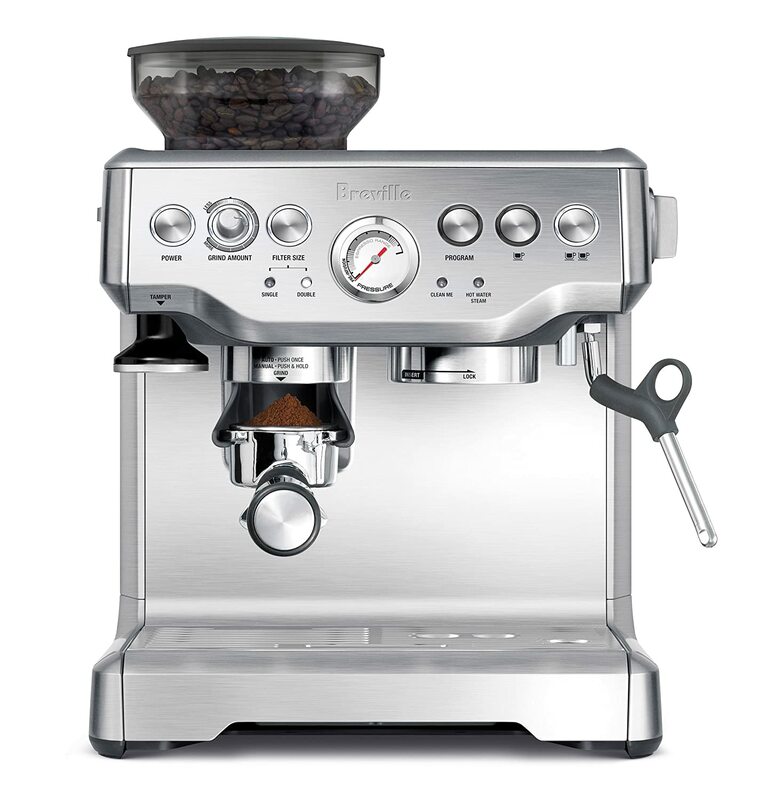 The Breville BES870XL Barista Express is a mid-range priced espresso machine. Unlike the more expensive espresso makers like the $3,000 Philips Saeco GranBaristo Avanti or the under $2,000 Breville Oracle BES980XL, the Breville BES870XL Barista does require a bit of effort and practice to achieve the perfect tasting espresso. With my experience, the resulting espresso shots from the BES870XL Barista are one of the best-tasting shots I had when compared to other mid-range semi-automatic espresso machines. Needless to say, the BES870XL definitely required a little bit of messing around to get the desired tasting espresso shot. With enough practice, you’ll master the perfect espresso shot in no time! I forgot to mention one thing, the speed at which the Breville Barista produces fresh espressos is incredibly fast! The design is incredible. The stainless steel casing on this machine keeps your kitchen counter looking lavish. This stylish looking machine does not sacrifice on maintenance! It’s easy to clean the BES870XL espresso machine and keep it that way! If I had to find a flaw in this machine, I’d defiantly complain a little on the fact that the drip tray fills up a little too quick. In my opinion, the machine has a lot of features that you would typically find on higher end consumer machines. I also really like the built-in grinder. It certainly makes for a machine grinder combo that takes up less counter space. Furthermore, this might sound a little bit trivial, but something that stood out to me, beyond the features and quality of the machine, was the quality of the manual. The manual was very clear, concise and easy to understand. The bottom line is, the Breville BES870XL Barista is the perfect espresso machine of 2019 for beginners and intermediate baristas. It is simple to use and takes just a little bit of practice to find the right espresso taste of your desire. Once you do, you’ll be calling the doctor to help you with your caffeine addiction! Don’t blame me!